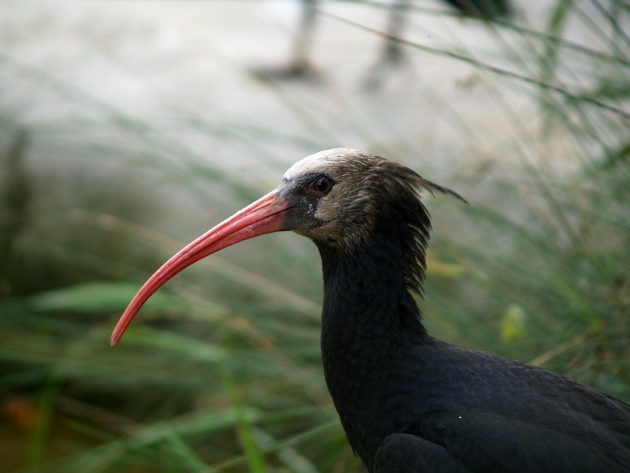 Among the most critically endangered birds on the planet is the Northern Bald Ibis. With wild populations in the Middle East estimated in the mere hundreds, any and every threat can have devastating results to the species’ long-term survival. Add to hunting, poisoning, and habitat loss and disturbance yet another man-made danger: war. A breeding program in Turkey has been successful, but civil war in neighboring Syria seems to have posed a significant hazard. For the past few years, many of the Ibises that migrated southward, across Syria, haven’t returned. As a consequence, Turkish conservation officials say they will cage the birds during migration season, to keep them from harm. It’s a sad state of affairs, but drastic times may call for such drastic measures. Hopefully, while the human conflict rages on, the Ibises in Turkey can cope with their unexpected captivity and look forward to someday once again following their zugunruhe.